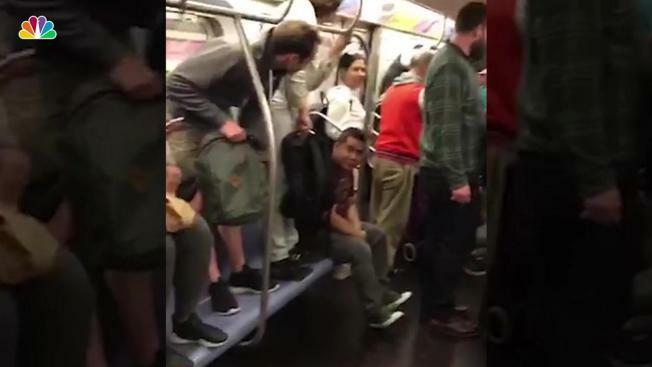 Terrified New York City straphangers jumped from their seats when a subway-riding rat made itself apparent on the L train. David Brown-King was riding the train last Thursday about 8 p.m. when the commuting rodent reared its tiny head. "I saw it crawling by a girl's foot," he said. "Then someone yelled, "It's a rat!" And everyone jumped up on their chairs." Brown-King started shooting video on his phone, which showed at least five people up on the seats and many more holding their feet up off the ground. "Even this big dude on the train was hiding behind me," Brown-King said. The video was reposted to the Subway Creatures Instagram account, where it has had more than 150,000 views. Brown-Kind said the rat looked like it survived by hiding in a corner of the cart under a seat (even though someone is heard making a threat to its life in the video).